In December of 2000, the �gGusuku Sites and Related Properties of the Kingdom of Ryukyu�h were designated as Japan's 11th World Heritage Site. A positive lord etc. were restored in 1992 though Shurijo disappeared by World War II in 1945. The Seiden (State Hall) is the most important building in Shurijo Castle. 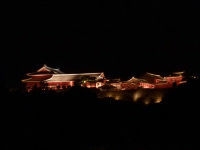 The three-story wooden structure has a first floor called 'Shichagui', where the King ruled over political or ceremonial events. The second floor, 'Ufugui', was where the King, his family and the female attendants presided over ceremonies. The third floor was a ventilation attic. Judging from excavations conducted prior to restoration, the Seiden was first built in the late 14th century, and since then has endured several fires and reconstructions at the same location. 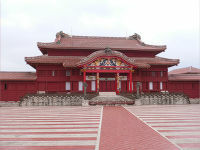 The present building was restored in 1992, modeled after the early 18th Century version that stood until the Battle of Okinawa. The Seiden is an example of distinctive Ryukyuan design, with a mixture of Chinese palatial and Japanese architectural styles. On both sides of the front stone steps are large dragon columns, and at the end of the parapet a pair of smaller ones. Dragons are also carved on many other pillars and beams. Shurijo Castle is home to many dragons, which symbolized the Ryukyuan King. The term Shurei means 'observation of the proprieties'. The plaque on the gate is inscribed 'Shurei-no-kuni' (Land of Propriety), in praise of the refined manners and proprieties of the Ryukyus. Of the many stonewalls and gates in shurijo Castle, Shureimon best exemplifies the castle's style, with its balance of design and elegance. It is a Chinese turret gate. In addition to their official names, many gates and buildings in Shurijo Castle have nicknames that reflect the poetic sense of bygone Ryukyu. Shureimon was formerly called Shurijomon, and fondly referred to as 'Ii-no-ayajo' by commoners, meaning the beautiful gate above. The gate was first built sometime between 1527-55 during the reign of King Sho Sei, fourth ruler of the second Sho Dynasty. Although designated a national treasure in 1933, the gate was lost in the Battle of Okinawa. 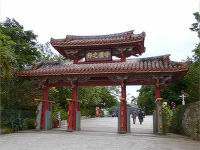 The present gate was restored in 1958 and has served as a tourist destination symbolizing Okinawa. The picture of the gate is printed on the 2,000-yen bill in commemoration of the year 2000. In the rampart in Shurijo, all the stone volumes are curves. 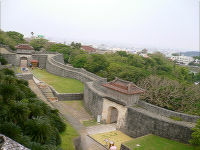 It was completely destroyed by the game against Okinawa of 1945 and the Ryukyu University construction in postwar days. Because it is excavated when a new rampart is constructed and it is used, a conventional rampart that slightly remains can see the appearance of a conventional rampart in the vicinity of surface of the earth. Restored neither building nor rampart are World Heritage. 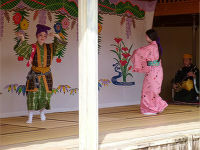 The Houshinmon Gate opening (Ukeejo) at Shurijo Castle Park is performed daily to welcome park visitors. At five minutes before opening, gatekeepers dressed in traditional attire signal the opening of the gate with a gong and cry "Ukeejo!" Daily from sunset to 12:00 A.M. (Subject to change when maintenance and inspection is required). the castle displays its serene existence with many light fixtures illuminating the castle throughout the year. and exists in the foothill in which it looks down at the Naha port that was the base of the overseas trade before.